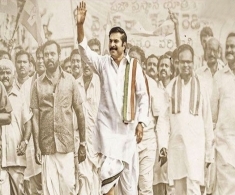 Sensing all odds against his party, Congress leader Dr Y. S. Rajasekhar Reddy decides to take padayatra across the state in a do or die battle. He begins the journey in Chevella in Ranga Reddy district and ends it in Ichchapuram in Srikakulam district. He meets cross-sections of people, listens to them, sees their plight, and observes the conditions and notes down all of them. This journey changes everything – Andhra Pradesh’s political scenario as well as his life.